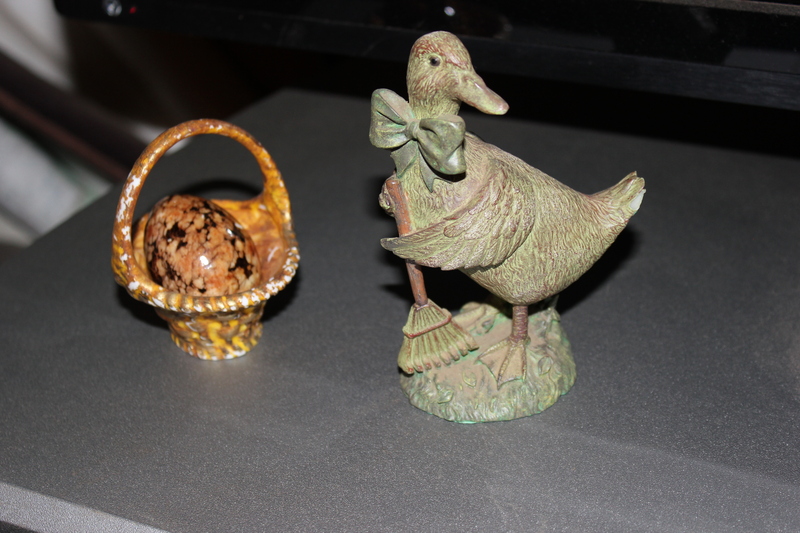 It is almost Easter! Can you believe it? Easter is April 5 this year, which means it is only four weeks away! Easter is by far my favorite Christian holiday. It doesn’t come with all the glam that Christmas does, but it is – by far – a more deeply spiritual holiday for me. Easter represents the day that Christ rose from the dead, fully alive, and forgiving all who ever did any sort of wrong (not just to Him, but in general wrong). It’s the day that represents the ultimate Get out of Jail Free card in the ultimate Monopoly game of Life. No strings attached (the Church likes to attach strings, but Easter really *is* no strings attached). I embrace all the heathen imagery that comes with Easter: eggs = rebirth, lambs = Lamb of God, bunnies = uh…CUTENESS, Easter Egg hunts = KIDS, colored eggs = artistic endeavors… OKAY, already. I’m stretching it. I love May Day, too, and dancing around the May Pole and dropping flowers on the neighbor’s doorstep while playing doorbell ditch. I even mix bunnies up. A big old lop-eared bunny with a family of little bunnies. And a requisite lamb, of course. I painted the big bunny. 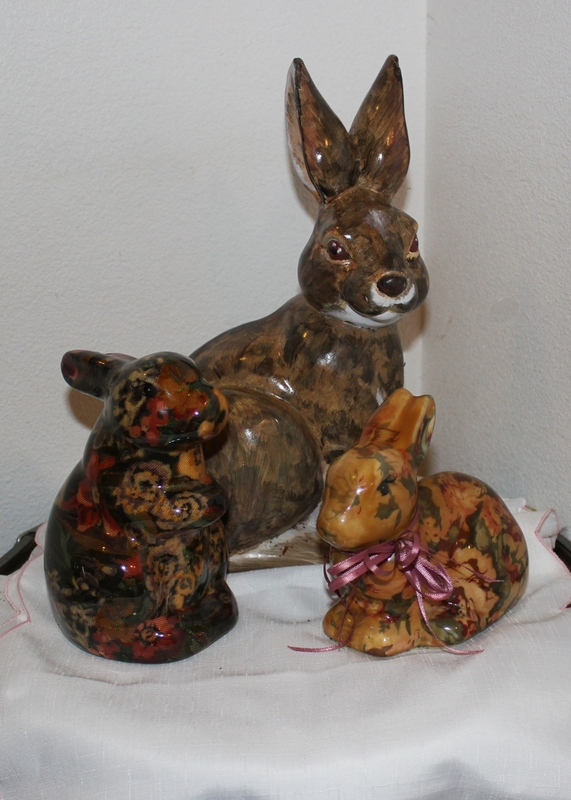 The other two bunnies were purchased at the same Goodwill store, but the one on the left was purchased one year and the one on the right was purchased a year later. They are serendipitous twins on a holiday that has nothing to do with rabbits or hares. Have you ever read “Watership Down” by Richard Adams? It’s one of my favorite books. Has nothing to do with Easter, but since bunnies are (somehow) an Easter symbol, I think you should read Watership Down. It’s about healing, transformation, sacrifice, and love. Please don’t look at that filthy blue carpet. 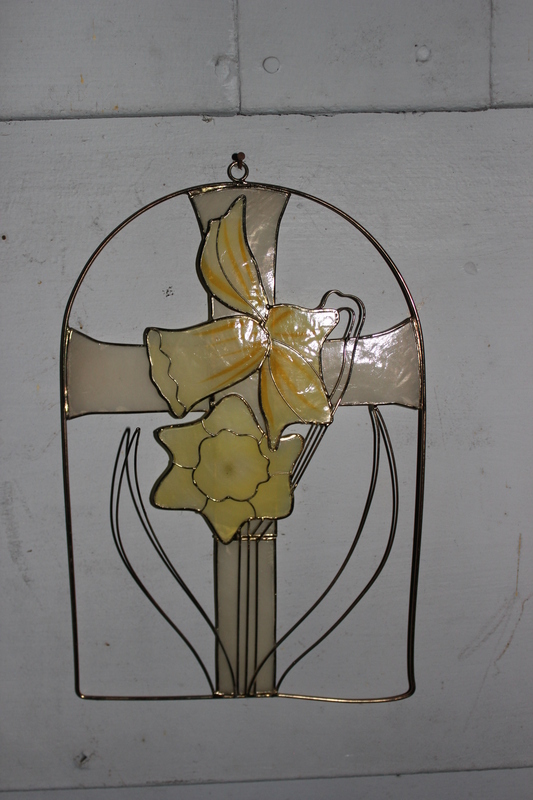 The cross is the ONLY cross I have ever come across for sale during Easter. I actually purchased it new from a local K-Mart. Funny how a holiday that is about Christ is not represented by the empty cross anywhere. Not to worry myself with minor details (these are just ceramic icons, anyway). 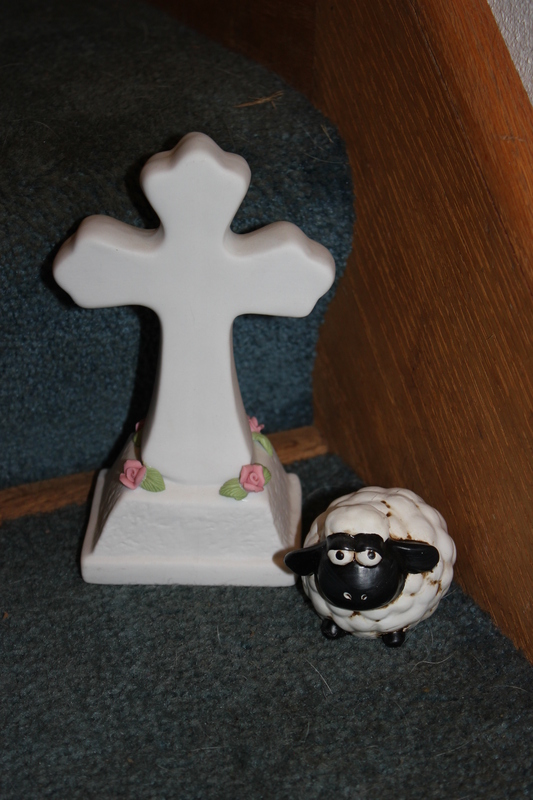 I found that adorable lamb somewhere and added him to my collection. I found this goose last year. 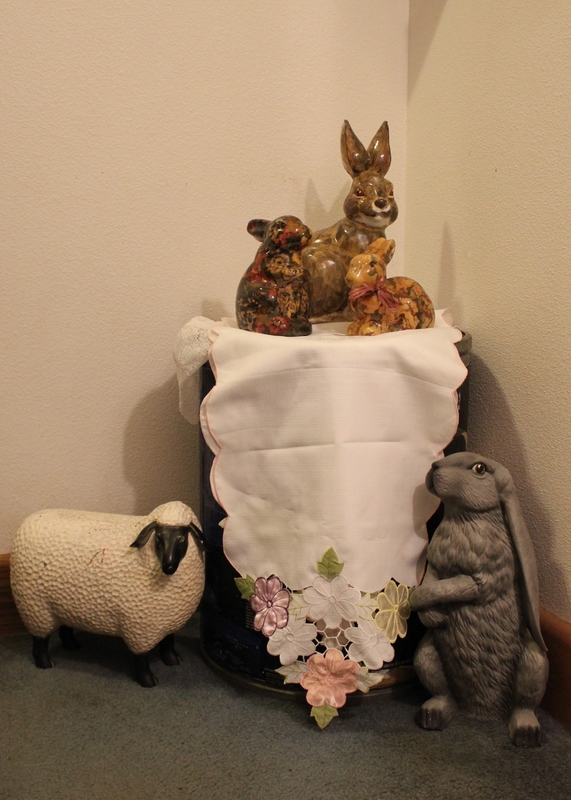 She has nothing to do with Easter, but Easter is the only place I can figure out to fit her in to my decor. I think she’s pretty cool. You’d think I’d have a larger collection of bunnies, lambs, and eggs by now. 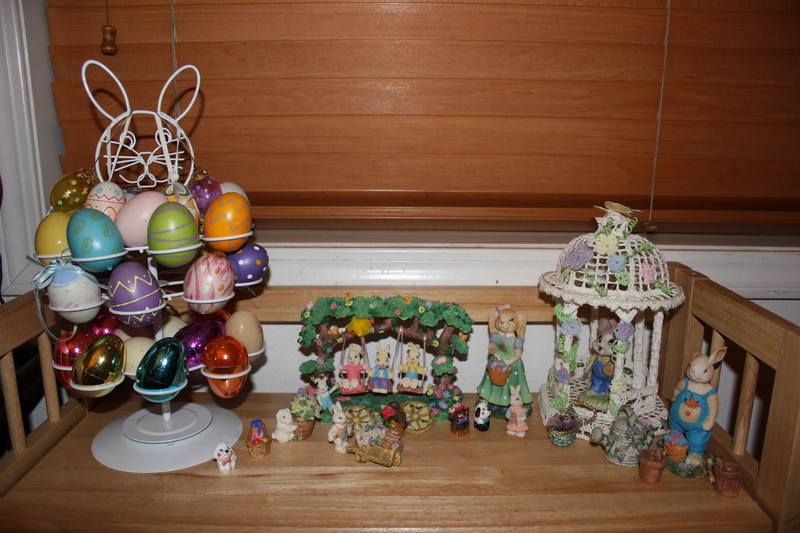 I don’t, because I am the only person in the house who really gets into Easter as a holiday in which to put up decorations. My husband sort of shrugs it off, recognizing only the spiritual side. My children kidnapped my grandchildren and moved far, far, far, FAR away. Hey, no passive-aggressive GUILT stuff going on here, you know? But who am I going to give chocolate bunnies and jelly beans to if my grands live across the continent from me?? I do get the outside door greetings out. 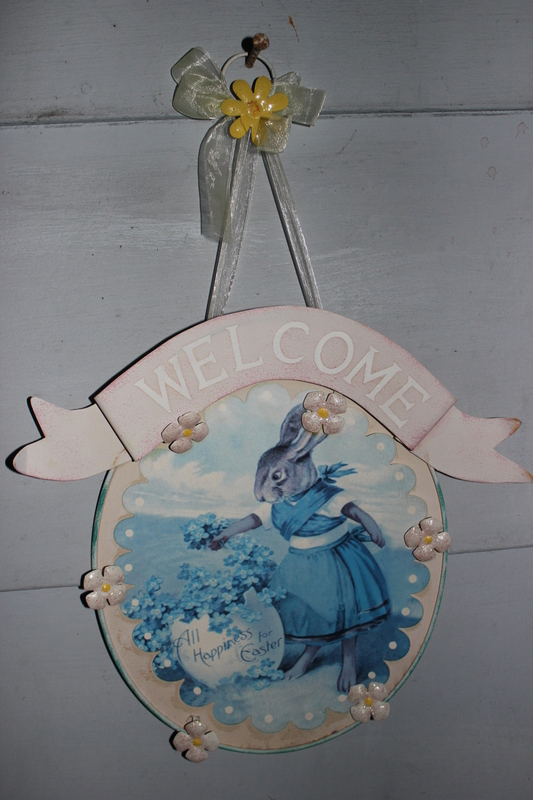 Vintage Easter works wonders for me. This is probably the most recognizable item in my Easter arsenal. She’s a cast iron cake mold. I have the original cake recipe & booklet (it’s a heavy spice cake). I made it several years in a row after my mom died, but then my kids grew up and moved away, and my husband doesn’t eat much cake. 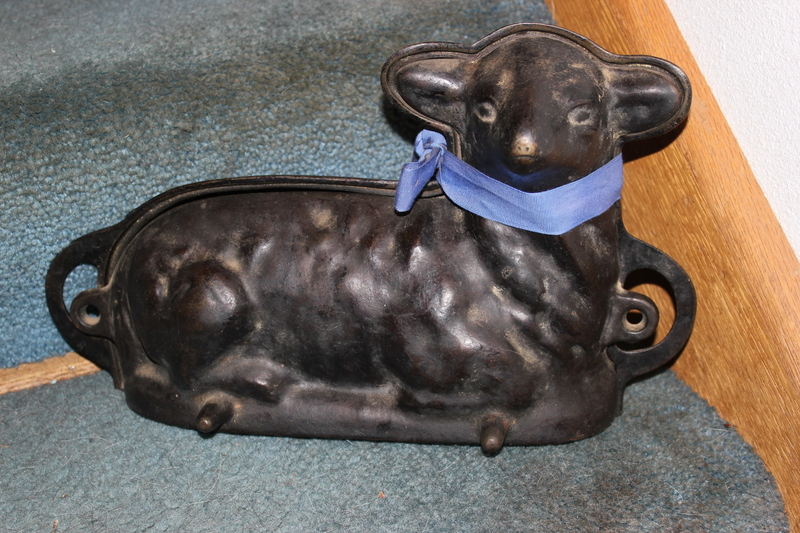 You can find a lot of copper or tin imitation molds, but this lamb is the original cast iron mold. She’s worth (roughly) $168 because I have the original Griswold recipe book & she’s in excellent condition. She’s Not.For.Sale. My mother owned her & I now own her. Finally, I just want to share this picture because it has nothing to do with Easter and everything to do with family. 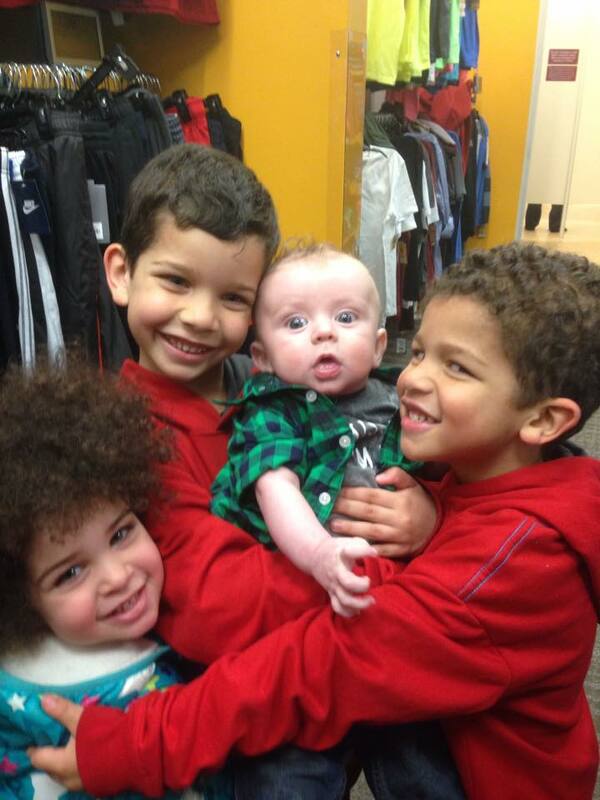 It is of four of my grandchildren (five are missing).